Obedient servants try to meet the Lord’s expectations by following directions and doing so rather poorly. The reason is that we’re not designed to be servants. God is very relational and it’s His desire to show us the purpose behind what He’s doing and engage us in carrying it out. His friends have a deep desire to exceed His expectations. We understand God’s hidden purpose and that is exactly what positions us for excellence – going beyond the letter. We carry His Spirit and co-labor in the spirit of His intentions. He wants us to part of His council. From the Heart – God designed us to be to be sons and Kings. We are not motivated by external carrots and sticks. He designed to be internally motivated from our own hearts and to share a part of His own heart. That’s what makes us tick. 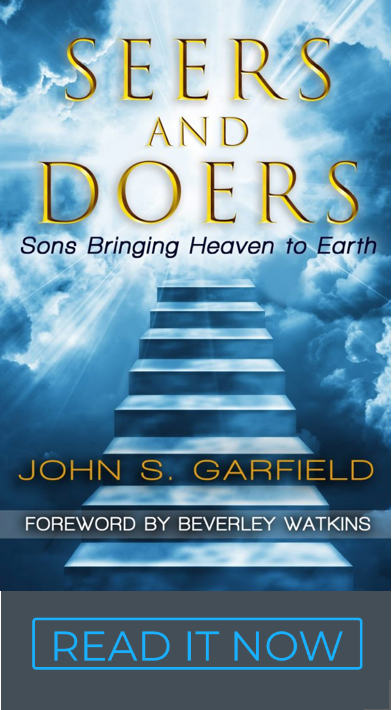 We are naturally most alive spiritually and motivationally when we have these three aspects of our purpose (book). Autonomy – the desire to be responsible for that which is our own (metron). We each have a book, a calling and race that defines our unique purpose. We’re not all stamped out of the same cookie cutter. Mastery – Being excellent at what we do. We are designed to be very good at something. Humility is submitting to that excellence and expressing it for God and men. Purpose – connecting to something bigger than myself. I’m seeing and doing the Kingdom, usually part of a tribe or team who carry the same purpose (ecclesia). A spirit of generosity – We have this sense of having a Father who loved us first and always exceeds our expectations. It’s very natural to long for ways to love Him back and exceed His expectations as an act of worship and thanksgiving. We start having fun – It’s not a burden to be ourselves and fulfill our purpose – It’s fun! Our work and ministry start to become the same thing and we’re fully engaged and continually renewed by it. Enthusiasm comes from two root words: en theo (in God). We’re free to be spontaneous – When I’m connected with my heart and my purpose, what to do next flows out of me very naturally. My identity and my work is secure and connected to the Father’s heart. Now I have the space to be creative and the courage to take initiative with those ideas. Now I’m listening – to my own heart and the heart of God. An amazing thing happens at this step. I start hearing what God has put in the hearts of other people. And, I can help them connect to that inner voice of the Father releasing their hearts. Now it’s fun to listen! I’m exceeding my Father’s expectations – Knowing my purpose and knowing I’m on the same page with my Father frees me from just following directions. I’m a friend with the latitude to make a few mistakes and think of it as normal. I expect to add value and innovation to the Kingdom. We’re Abraham’s sons – our heritage is the nations and our words / His words give life to things that have died, and we speak things into existence that were not here before. 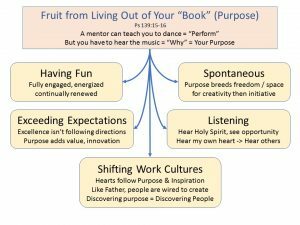 Shifting cultures – Exceeding my Father’s expectations goes the extra mile, loves when love isn’t deserved, forgives 7 X 70, and multiplies talents. The attitude of going far beyond the minimum births creativity and innovation and blesses the heart of God. Exceeding expectations has a huge impact on those around us. It’s spiritually contagious because that’s how God wired us . . . for abundance, extravagance, excellence, enthusiasm, adventure and integrity. People are wired to follow the heart of God. Those who exceed expectations are always the leaders. Examples – Jesus, how can I bless your heart by exceeding your expectations??? I’m not just contending for my own book anymore. . . “Intentional Reformation” of nations. I’m enlarging my tent to receive . . . the backlash of His generosity and delight.